Upon arrival, you will be met on arrival by our English speaking Representative and assisted with transfer to hotel. Balance of the day is free at leisure. Stay twelve nights at the Melia Bali Resort & Spa — Melia guest room. Free days at leisure to explore on your own or take below 5 complimentary sightseeing seat-in-coach tours, please book with the hotel. Besakih Temple, regarded as the largest and holiest temple in Bali. is built on the slopes of towering Mount Agung, Bali's most sacred and highest volcano, which last erupted violently in 1963. Enjoy the skillful Barong and Kris Dance. Visit talented artists in their workshops on the way to the beautiful Lake Batur and finally the fascinating Bali Bird Park. Drive to one of the most beautiful temples in Bali and the monkey forest on the way to Tanah Lot. Watch the sun set and silhouette the temple. Unforgettable! Drive to the North coast, winding up the mountain, offering magnificent views until some 1,200 meters above sea level where a striking panorama is revealed. Bali is a shoppers paradise. 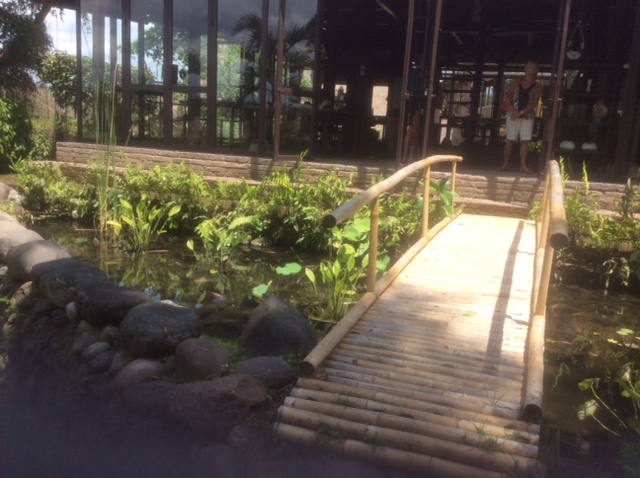 This tour visits the handicraft villages of Bali. Batubulan renowned for stone carvings; Mas for woodcarvings; Celuk known as silver and goldsmith village; Sukawati, the traditional art market; and Ubud, international famous for art and paintings. Book the tours at your chosen resort. We are staying at the Melia Bali resort and believe me the long trip made it worth every minute we have at this amazing resort. From our room we go right into the lovely warm water, we never want to leave this place. Bali is every thing I thought it would be. Lush gardens nice beaches and the most beautiful people you could ever wish to meet. Had a tour today of all the rooms each one is lovely. Off this evening to a beach to see the sunset and enjoy a seafood dinner. With our package comes 3 full day and 2 half day tours. 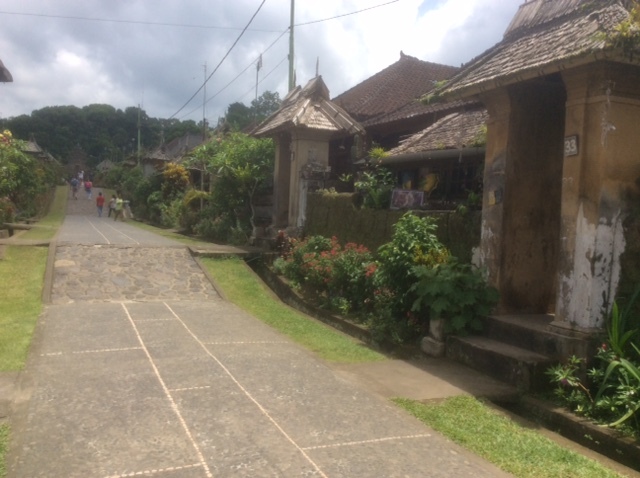 We took a tour yesterday that took us to Eastern Bali, this took us to the a traditional village shown in this photo. Here we were able to see the social structure dating back to the 16 century. We went on to see the highest volcano in Bali, unfortunately it was in clouds which it usually is. 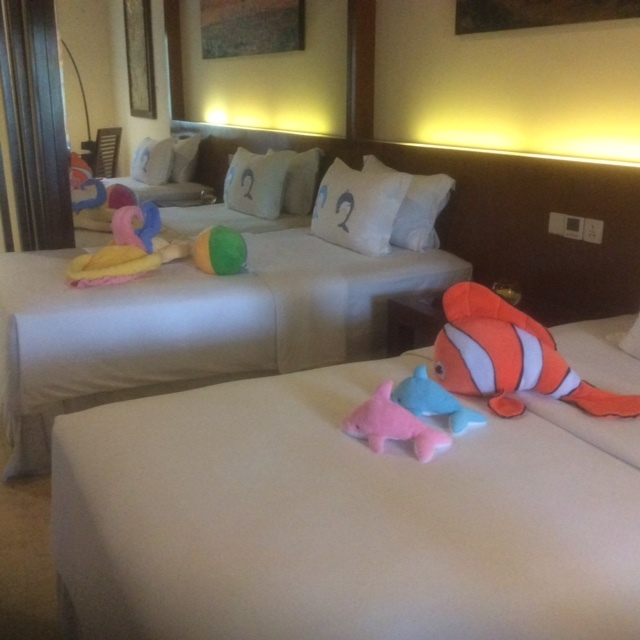 Our resort the Melia Bali really caters to families, I did a tour of the rooms yesterday and want to show you a family suite. The room has a loft with a king for the parents 2 tv's, the bathroom has all the amenities for kids. Although we are seeing lots of kids there are lovely areas for Adults only. 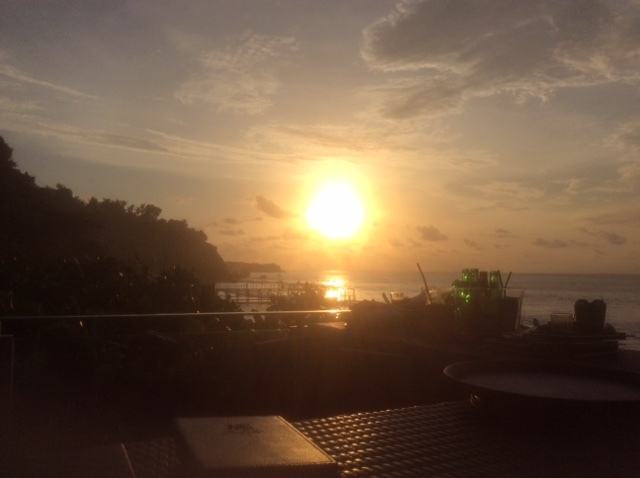 Bali is known for it's amazing sunsets. We were told the Rock bar was the best place to view it, it was truly beautiful. The Bar is at one of the best hotels in Bali the Ayana formerly the Ritz Carlton. The weather is very hot and humid really exhausting if you are walking a distance. The weather in Bali doesn't change to much through the year,we are at the beginning of the rainy season. It has rained at night but beautiful during the days. We drove to the John Hardy Gallery to see where some of the most beautiful jewelry is designed and made. They have over 500 employees working there, John Hardy is a Canadian from Toronto. Once you see the time that goes into each piece it was truly amazing.